Rose Li died on 29th July 2001. Her name won't mean much, at first, to most people who read this, but in her time Miss Li was an important person in the transmission of Tai Chi, Bagua, and Xingyi from China to the West and particularly to the United Kingdom. She was my teacher from 1977-1984. Miss Li first came to notice in the Bagua and Xingyi books, published respectively in 1967 and 1974, written by Robert Smith. In the Bagua book, Smith quotes from Miss Li about the subtle theory of Bagua and how few westerners could appreciate it. As for Xingyi, it was an open secret that Miss Li was the anonymous Xingyi teacher, who "taught Chinese at a mid-western university", whose students had such little appreciation of Xingyi that she refused ever to teach it again. 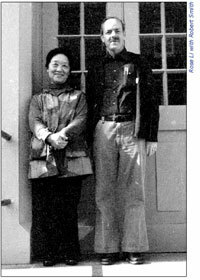 From such beginnings Robert Smith and Rose Li formed a friendship sustained mainly through correspondence and meeting occasionally. Robert Smith celebrated this relationship by devoting a whole chapter to Rose Li in his book, Martial Musings. It gives an accurate account of her personality, attitudes, and her art and should be read in conjunction with this memoir. According to the accounts of those who cared for Miss Li in her final years, before her death she expressed the wish that her teachings would not die. Since her passing there have been some moves by her final students to collect her papers and perhaps produce some sort of book, but nothing has appeared apart from a short obituary in the Tai Chi Union of Great Britain magazine. Time is passing. In my own practice and teaching, I have always been open about the debt that I owe to Miss Li. Accordingly I have been urged by friends (particularly Dan Docherty) and students to commit to writing my own memories of Miss Li. This memoir is therefore the result of that urging. I acknowledge from the beginning that it is partial. Inevitably it covers only the period that I spent as Miss Li's student, from 1977 to 1984 (when I moved to Greece to pursue my archaeological career). Conclusions that I may draw are dependent on the information revealed by her during that time. Undoubtedly there will be some errors in this memoir. If so, I apologise in advance, and invite those students who continued to learn with Miss Li until her death to come forward to correct or add to anything I may say here. Nevertheless the period 1977 to 1984 was arguably the time at which Miss Li was at her most infl uential in the development of the Neijia in the United Kingdom. During that time Robert Smith's charming hyperbole that she was the "greatest Hsing-I boxer" to come to the west may indeed have been true. With those provisos in mind, I therefore dedicate this affectionate and respectful memoir to Rose S.C. Li as the teacher who firmly set me on the path of the Neijia, and whose teaching and insights continue to infl uence me. [In the following analysis of Miss Li's teaching, I have laid out each art in two sections: first, an overview of what she taught, and second, concepts she communicated to us, based on my notes from those days]. Tai Chi was the mainstay of Miss Li's teaching. It was the art most students came to learn, and she more or less insisted that it should be learned even by those students who were more interested in Bagua and Hsing-i. It is perhaps a little ironic then that of the three arts she taught it was the one for which she had least affection. A perennial question that arose from almost all students at one time or another was: what style of Tai Chi did Miss Li teach? In my time with her she invariably brushed aside such questions as irrelevant. Her answer was that in her time there were no distinctions between styles and Tai Chi was just Tai Chi, and you should just get on and practice. If pressed, she would occasionally reply that if you wanted to call it something, call it Beijing Tai Chi. Interestingly this was quite a revealing reply, though I didn't realize it for some years. As for the Form itself, she taught only a Long Form in six sections, though to beginners she would teach a shortened version consisting of sections 1, 2, and 5 before allowing then to progress to the full version. The Form itself was long, one of the longest I have ever seen. In most cases the postures were fairly orthodox, similar in appearance to Yang and Wu Style versions. But she did have some idiosyncrasies. For example, even in the standard forward stance, she favoured a more back-weighted upright posture than is normal in Yang/Wu Tai Chi. Part of this undoubtedly came from her main art of Xingyi, but it bears some similarities to Cheng Man-ching's Tai Chi posture; in this she may have been influenced by her friendship with T.T. Liang, whom she acknowledged as one of the first to encourage her to pass on what she knew. More specifically she also modified certain postures, most obviously White Crane Stretches its Wings: in orthodox Tai Chi this has the left hand down by the torso and the right raised by the head. In Miss Li's version both hands were down by the torso. I can only guess at the reasons for this modification. It may have been that she used this as a signature posture. Alternatively, this modified posture does focus a feeling of power coming from the back, which was a point she often emphasized. Another characteristic of her Tai Chi was that she encouraged students to do (or at least did not discourage them from doing) the Form extremely slowly. Her senior students could take as long 45 minutes to complete the Long Form. I have to say that trying to do this was extremely painful on the legs, but it did also strengthen them rapidly. But this slowness may also have contributed to a negative aspect of the Tai Chi of Miss Li's students about which Robert Smith comments. In Martial Musings (page 254), he comments that on one of his trips to London he observed that the senior student that Miss Li chose to demonstrate her Tai Chi was stiff and hard, quite the antithesis of what Tai Chi is supposed to encourage. Remembering the senior students of that era, probably the criticism is justified, but I do think it was the consequence of this excessive slowness. As soon as China opened up to visitors around 1980, Miss Li was one of the first to return, to renew contacts and to find out what had happened to her family property, classmates etc. Soon after one of her visits I met her in London's Chinatown, where I had also just bought Wang Peisheng's now famous book on Wu Style Tai Chi. When I showed the book to Miss Li, she commented that Wang was a Tai Chi nephew, and she had met him recently in Beijing. This was a clue to her origins within Tai Chi. Until his recent death, Wang Peisheng was well-known as one of the standard bearers of the Northern or Beijng Wu Style, that of the non-family students of Wu Quanyu, father of Wu Chienchuan. Indeed she did eventually reveal that her Tai Chi teacher was Liu Fengshan (a.k.a Liu Caizhen) a direct student of Wu Quanyu (this is confirmed by Smith, page 252). Liu taught Tai Chi at the school of Deng Yunfeng, Miss Li's Xingyi teacher, but Miss Li certainly never had the affection for Liu that she had for Deng. This means that Miss Li's Tai Chi can be firmly identified as deriving from the Northern or Beijing Wu Style. Other aspects of her Tai Chi may also be worthy of comment. She taught a preparatory exercise to do before the Hand Form, which she called Tiger Rolling the Ball. This exercise was a variation of Bagua's Lion Rolling the Ball, and was the only Chi-kung exercise that I recall Miss Li teaching. She would also never demonstrate the complete Hand Form or indeed even large sections of it in class. She would only ever demonstrate the movements she was teaching. Her stated reason for this was that she wanted her students to develop their own way of doing the Form, and not to try and simply copy her mannerisms. Over the years I have seen so many students judge their own ability with their Form on how well they can merely mimic their teacher. Thus I have to say that I think Miss Li was correct on this point. In the years I was her student Miss Li only ever taught Hand Form; there were promises of teaching Pushing Hands and Sword Form, but nothing came of these. Eight powers - Miss Li certainly used the conventional expressions of Peng, Liu, Ji, An, Cai, Lieh, Zou, Gao, but she also gave some additional nuances. E.g. Contained within these are nuances derived from the Three External Harmonies (hand/ foot, elbow/knee, shoulder/hip). They do also express the idea that the potentiality of power is continuously maintained in those body points irrespective of particular Posture. Kai/He (open/close) - this was an especially favoured principle. Miss Li found various ways of expressing it. She also used the terms shen and tsoer (I am uncertain of the actual Chinese) translated as expansion/going out and contraction/coming in. In our attempts to express this Miss Li was concerned that we were able to use the expansion/ contraction not just into our bodies and arms ("from the centre"), but also in our hands and fingertips. She often complained, especially of those of us who had done external martial arts, that our hands were stiff, wooden, dead; thus she often exhorted us to have hands that were alive. My notes of this period include a quote from Chang Chung-yuan's book Creativity and Taoism (page 9), which for me expressed well what Miss Li was trying to communicate to us: "where things grow and expand, that is kai; where things are gathered up, that is he. When you expand you should think of gathering up, and then there will be structure; when you gather up you should think of expanding, and then you will have inexpressible effortlessness and an air of inexhaustible spirit". Reeling Silk - again, this was another favourite concept. Sometimes, when she talked of this, she would show us the famous drawing of the human figure with spiral lines around it, taken from Chen Xin's Chen Tai Chi book. I presume that book has been preserved in her papers. "6 Points: 2 hands, 2 feet, head/neck, waist/ dantien". These were points to concentrate on to create an effective whole body co-ordination. "Tai Chi uses hsin chi" - I take this to mean that Tai Chi uses (or should try to use) chi from the xin (heart mind). This is a profound and difficult traditional teaching in Tai Chi. Miss Li only occasionally mentioned it. More often she talked of Yi (mind-intent), and how that would help us to use chi in our movements rather than li (brute physical strength). "Purity, Truth, Accuracy, Sincerity, Regularity, Totality" - these precepts were to govern our practice. "In Taoism the earth is flat, and heaven is round. The Tai Chi step feels the earth flat - the shoulder presses heel, the heel pushes the knee, the knee pushes the palm. The arms feel heaven round, so movements and gestures are never linear. And to balance the hands, they must move together. Movement must be total: 10 fingers and 10 toes. Sung: loose, but strong, even in standing." "If the legs wobble, chi has not gone down into them to make them steady (a bad unhealthy life affects chi). Chi is for health (not fighting) to feel light, but not floating when moving". "Tai Chi theory says that chi flows through the marrow. P'i-erh (flat) if you turn the arms and elbows in too much (e.g. in circling to cross the arms) then an obstacle is created and chi cannot flow - broken elbow. Tui ch'o - movements, arms rounded".